Undercover Israeli soldiers invaded, on Tuesday at night, the al-‘Isawiya town, in occupied East Jerusalem, and abducted two teenage boys. 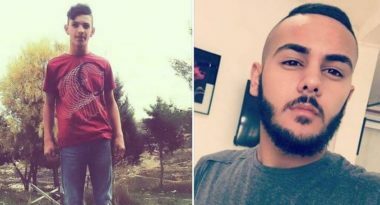 Media sources in Jerusalem said the undercover soldiers infiltrated into the town, before kidnapping Abed al-‘Oweiwi, 16, and Mohammad Mousa Hamdan, 19. The undercover soldiers then drove away, taking the two Palestinians to an unknown destination, before regular army units invaded the town, and started firing flares, in addition to live rounds, gas bombs and concussion grenades, at Palestinians who protested the attack, and the abduction of the two teens. The soldiers also invaded many neighborhoods and alleys in the town, and chased several Palestinians in an attempt to abduct them. In related news, an Israeli court in occupied Jerusalem ordered six young Palestinian men, who were abducted on Tuesday at dawn, under further interrogation. They have been identified as Mahmoud Abdul-Latif, Rami al-Fakhouri, Rawhi al-Kalghassi, Jihad Nasser Qous, Mahmoud Mo’nes and Jamil al-Abbassi.